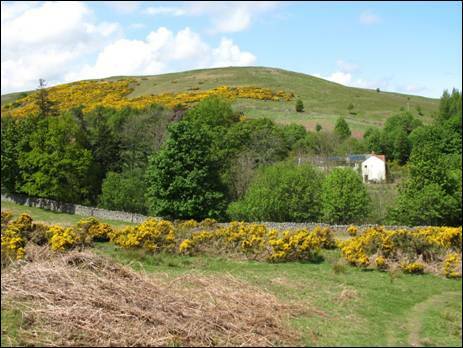 The quiet haven of the Humbleton Burn Picnic Area lies within shouting distance of the north Northumberland town of Wooler and makes the ideal starting point for any number of walks in the Cheviot Hills. Whether you are looking for an epic day out or just a short meander around the foothills to the west of the town a close study of your map will reveal a host of interesting possibilities. 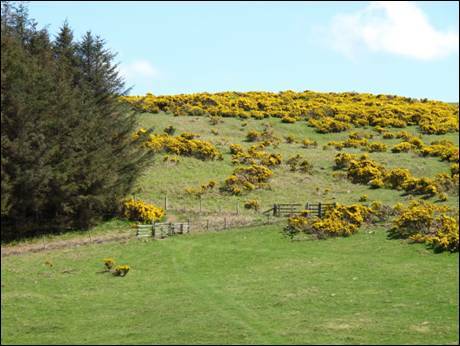 On this particular walk you will start your day by heading across Wooler Common to the grass-covered summit of Hart Heugh where you will enjoy fine views to the Cheviot heartland before then making your way downhill to the junction of the Carey and Harthope Burns. After a short and pleasant stroll along the Harthope Valley single track road you will begin your long and steady climb to the triangulation-topped summit of Cold Law. Once again you will enjoy superb views of the surrounding hills before heading back to the Carey Burn via Carling Crag and the gentle slopes of Snear Hill. From here you will follow a narrow, hillside-clinging path which runs parallel with the Carey Burn as far as the short and sharp climb up the appropriately-named Hellpath. Along the way you will pass one of the areas finest waterfalls. Once back on the open moor the majority of the climbing is behind you and it is just a simple matter of enjoying the last 1½ miles (2.4 km) of the route as you stroll happily back to the tranquil surrounds of the Humbleton Burn. Your appetite will have been whetted. 1. Consisting of ponds, footpaths, a bird feeding area and an information board, the Humbleton Burn Picnic Area is a comparatively recent and popular addition to the landscape of the area. These days it is a tranquil place to start a walk but it was not always that way. During World War I, targets were hoisted by the military on the now plantation-shrouded slopes of Brown`s Law whilst soldiers, located further down the valley, took aim and fired. For many years the area was shown on local maps as `The Targets`. 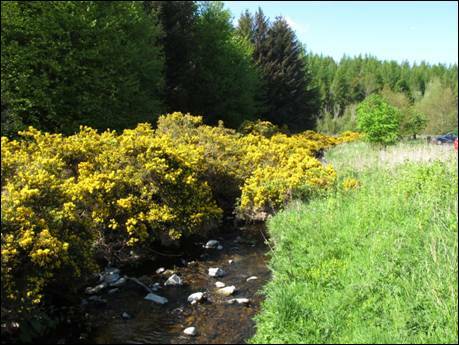 There is a well surfaced car park (GR NT977272) just prior to the road bridge across the adjacent and delightful Humbleton Burn. When W. Ford Robertson wrote his excellent 1926 guidebook, `Walks from Wooler` the bridge across the burn had not been built and his instructions to walkers heading this way from Wooler were to, “continue along the Common Road until the ford near the Targets is almost reached”. However, for those wishing to cross the burn and wanting to keep their feet dry there was a convenient footbridge. For the present however you are not required to cross the burn. So, once you have sorted yourself out, leave the car park and cross over the road to the nearby signpost following the finger indicating, `Wooler Common ¾ Broadstruther 3` along a path which sticks close to the Humbleton Burn. To your left the dark cloak of a coniferous plantation covers the slopes of Kenterdale Hill whilst over to your right stands the dwelling of Petersfield which you will pass on the return leg of your walk. Due to the proximity of the path to the burn and its low lying position this stretch of what is part of the route of 1996-inaugurated St. Cuthbert`s Way can be extremely wet. So, take care and watch your footing. Soon you will reach a stile of sorts and once you are safely onto the opposite side you need to follow the path which begins to climb the small, gorse-flecked rise slightly to your right. Ignore the path which runs along the base of the slope. 2. Keep to this path as it cuts across the eastern flanks of Wooler Common and eventually this will meet up with another path arriving from your left. Your route bends to the right and, as it starts to reach more level ground, you will continue forwards with the fence close to you on your left. Ahead, you will see a cluster of small buildings on Wooler Common, referred to in W. Ford Robertson`s, `Walks from Wooler` as, “the cottage of Reastead”, and whilst the bridleway you have been following continues to the right of the neat buildings you should curve to your left towards the signpost and the large gate. Once through the gate, turn right and follow the track which passes to the left of “Reastead”, noting as you go the stile and the sign on your right just beyond the cottage. This is your eventual return route. For the time being however continue walking straight ahead and slightly uphill passing, on your left, a plantation as you make your way towards the open moor. Diagonally to your right stand Watch and Fredden Hills, the latter, at 347 metres high, being a mere 3 metres higher than its next door neighbour. Soon, as you reach level ground, you will see to your left the hill of Hart Heugh. You will also see a subsidiary track (GR NT964261) leading off to the left which heads towards a five bar gate and thence to the saddle between the twin tops of Hart Heugh. This is your route first over relatively level terrain and then, once through the gate, on a gently rising track through low level heather. The area around Hart Heugh is littered with the remnants of previous and long since vanished settlements including a Bronze Age burial cairn on the subsidiary summit to the left of the saddle. Once you have reached the highest point of the saddle you will need to strike out to your right always heading for the highest point. 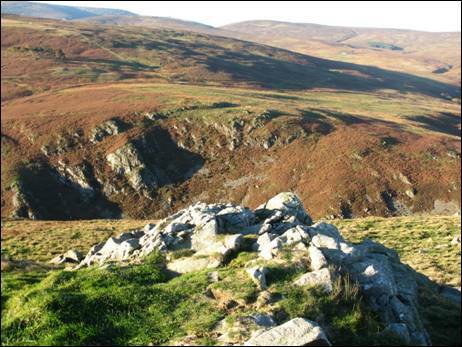 Once safely on the top, you will find a large and rambling cairn along with a fine array of outstanding views. At 326 metres above sea level this is not the highest hill you are likely to bump into but the panorama is extensive. Be sure to explore the full extent of the grass-covered summit including the upper reaches of the south western slopes where you will enjoy airy views of the Carey Burn and your ultimate return route. 3. Once done with the views, head back to the saddle and then turn right to commence your descent towards the Harthope Valley. But first, after eventually reaching and crossing a small stile, you will come face to face with a solitary and somewhat aged tree together with the very scant remains of the cottage of Switcherdown (GR NT975254). These lie slightly to the south west of what little remains of the small coniferous plantation named on the Ordnance Survey map as `Switcher Wood`. When the book, `Walks from Wooler` was published in 1926, Switcherdown was already a ruin which W. Ford Robertson described as standing beside, “a clump of elm and ash trees” and where, , “tradition says there once dwelt a witch”. So, watch your back as you pause for a moment to enjoy the view, “of the lower part of the Harthope Valley, of Langlee Crags and Housey Crag, and of Hedgehope towering in the distance”. Now continue your downhill journey keeping the fine drystone wall close to your left hand side. A decent track will in time lead you to, and then over, a gate beside a small hillside plantation. Keep heading past the plantation and you will rapidly land in the valley of the Carey Burn. Turn left and follow, as best you can, the faint trace of a footpath which keeps relatively close to the burn on your right, with a fence to your left, as it makes its way to the Carey Burn Bridge. Cross over the stile to join the narrow single track road which to the left heads towards the steep climb to Skirl Naked and, to the right, into the Harthope Valley. This is your onward route and, as you wander merrily along, you will undoubtedly see the notice warning passing motorists of the presence of pheasants. You might well have spotted or, at least, heard a number already as this stretch of the valley is most definitely a popular meeting place for these vociferous birds. This pleasant and winding road was described by Robert Hugill in his 1931 published book, `Road Guide to Northumberland and The Border` as the, “rough but practicable road up the beautiful valley of the Harthope Burn”. After a short distance you will come to a signpost and a stile on the right of the road indicating the route to Cold Law (GR NT969241). Cross over the stile and take a deep breath before you start your upward journey across the slopes of Snear Hill, a journey which will ultimately lead you to the summit of Cold Law. 4. At first, this has the appearance of being a bulldozed track, now greened over, sunken in places and, particularly after periods of rain, rather wet. However, it is overall a pleasant and simple surface to follow which in time begins to change from track to thin path as you move ever closer to an uphill-climbing post and wire fence. 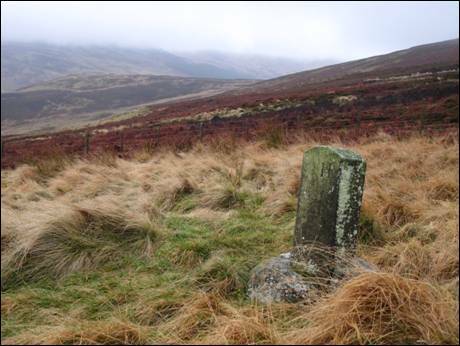 You will soon spot, slightly to your right, one of the many old boundary stones which are dotted about the Cheviot Hills. This one has the initials `SH` carved into the facing side and, from a distance at least, it looks suspiciously like a headstone from some age old and forgotten grave. Ahead, you will see a stile across the fence although little sign of a discernible path. Cross over the stile and whilst a nearby post indicates a route which eventually turns towards the south west following the `permissive` path marked on the Ordnance Survey map, your route remains close and personal with the post and wire fence. There is the semblance of a trace to follow through the heather as you climb through 50 metres of contour lines to the saddle between Carling Crag and Cold Law. This is marked by a facing post and wire fence along with a signpost. Cross over to the other side to join a rather messy and broad track. Now turn left and follow the graded track for a short distance until you spot a gate in the fence on your left hand side. Clamber over the gate (vault it if you are so inclined) and, turning to the right, head uphill passing some small unnamed crags on the other side of the fence. When the path bends to your left over more level ground follow it and before you have time to sing a verse of your favourite song you will be within sight of the triangulation pillar-marked top of Cold Law (GR NT953238). 5. Standing at a height of 452 metres (1483 feet) this mainly heather-clad hill invariably lives up to its name although the inevitable blasts of chilly air are worth enduring for the excellent views you will enjoy towards The Cheviot, Hedgehope Hill, Broadhope Hill and many others besides. 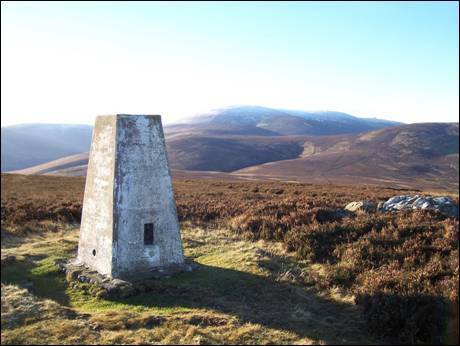 The triangulation pillar, which stands on a small island of cropped grass, was historically a 3rd order pillar with the nearest secondary pillar being located on Hedgehope Hill some 4.1 km (2.5 miles) away. The nearest primary pillar, part of the `backbone` of the system, stands tall and proud on the mighty Cheviot some 5.5 km (3.4 miles) from this spot. Before you leave the summit it is worth continuing across the summit for 100 metres to the medium sized cairn which as well as offering you a great view into the Harthope Valley also gives a degree of shelter should you wish to linger a while. Now head back past the triangulation pillar to the fence and, once reached, turn right and retrace your steps to the saddle below the summit of Cold Law. Now, instead of returning down to the valley the way you arrived, keep heading straight on past the obvious although relatively small Carling Crag on your left. From here you will descend easily for approximately 350 metres until you reach a small stile over the fence on your right hand side. Cross over and for the next 1.8 km (1.1 miles) you will be following a generally clear public footpath over relatively easy, although in parts potentially damp, ground. As you go, be careful not to wander off course particularly soon after you have started your gentle descent as it is easy to drift too far to your left. 6. As you approach the valley the views stretch out over Skirl Naked to the hills on the far side of Wooler Water, including a prominent Ros Castle, and beyond to the North Sea coast. Once you are close to the base of the slope you will pass Coronation Wood along its northern edge before then reaching the narrow valley road you strolled along an hour or two previously. Turn left and cross back over the 1956-built Carey Burn Bridge, noting slightly upstream the stone pillars of an old footbridge which was washed away in the extensive floods of 1948, and then immediately cross back over the small stile on your left hand side. Now retrace your earlier footsteps but, instead of turning back uphill to Switcherdown, continue to keep with the path which squeezes through the ever-so-tight and gorse-littered valley of the Carey Burn first as a green track but then as a thin scree-contouring path. Take care as you make your way forwards slightly above the burn until, eventually, you reach the delightful Careyburn Linn. In his book, `Walks from Wooler`, W. Ford Robertson wrote, “below Hartheugh glidders, Careyburn Linn is passed”, adding that, “it is a favourite spot for picnics and the waterfall is quite a good subject for the camera”. Indeed it is, on both counts, so you may decide to stop for a little while before you continue your walk. 7. 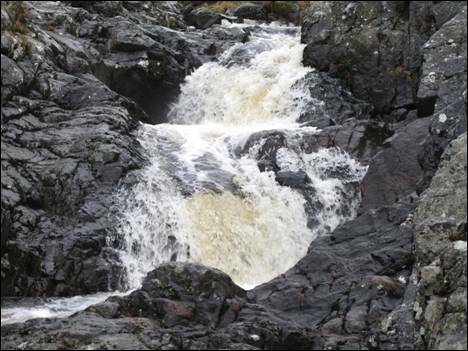 When you are ready to leave, head upstream following the path running alongside the burn and which, at one point, drops right down to the water`s edge where a careful manoeuvre will be required. No real difficulty, just careful foot and hand placement. As you continue with the burn you will pass a wooden shelter before reaching a plantation on your right hand side (GR NT961257). The path now sticks with the plantation edge, with the burn still to your left, over relatively damp ground which, in a few places, a fairly overgrown wooden walkway has been laid to aid progress. This walkway has been covered with chicken wire presumably with the intention of preventing as far as possible wet boots slipping on wet wood. Nevertheless, take care and soon you will join a green track which arrives downhill on your right together with a directional marker post. This is the base of the Hellpath which, rather than describing the nature of the incline, is simply a corruption of `hill path`. Folk who have run this way on the return route of the annual 20 mile Chevy Chase fell race might, understandably, suggest otherwise. For them, it is most definitely a sting in the tail. Now it is your turn to experience the Hellpath for yourself. So, turn to your right and start the steady climb across the lower slopes of Watch Hill eventually reaching a small gate which will take you out onto the open moor (GR NT962259). 8. Stay with the track as it reaches flatter ground with Hart Heugh to your right and Fredden and Watch Hills to your left. You are now retracing your outward footsteps as far as the cottage on Wooler Common which you passed earlier in the walk. Immediately before the buildings cross over the stile on your left, signed `Brown`s Law` and once across the small field cross over a second stile. Turn left, also signed `Brown`s Law, and then when the track turns sharp right downhill stay with this deteriorating track to the bottom of the hill. Once there, keep more or less straight on passing through a large gate and then over a small wooden footbridge which the keen-eyed will note has a small memorial plaque fixed onto the hand rail bearing the inscription, `In memory of Stanley Bell 1916-1991 Who loved these hills`. Now, a very short climb leads you to the tarmac Common Road which, to your left, leads to the remote Commonburn House. Your route lies to your right passing first the tidy cottage of Brownslaw and then the larger dwelling of Petersfield before then delivering you back to the Humbleton Burn Picnic Area. Now start thinking about your next Cheviot walk. Humbleton Burn Picnic Area, Wooler (NT977272), (NT964261), (NT975254), (NT969241), (NT953238), (NT961257) & (NT962259). Generally good paths & tracks which are easy to follow. Some ascents & descents although generally they are not overly steep.